This skirt is ridiculous and I love that about it. 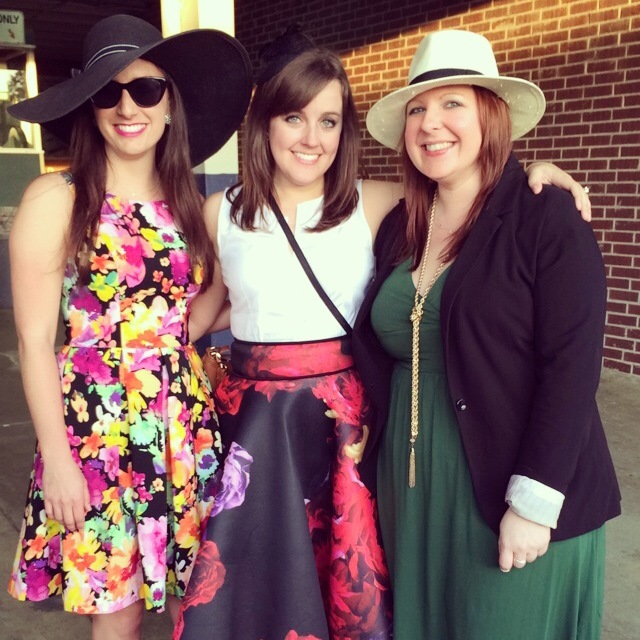 I'd probably never be able to wear it to work or the grocery store, but the Arkansas Derby? You betcha. This was the perfect costume for a day at the horse races. Same thing goes for the fascinator. Don't ask why I have one, I don't know. Also, don't ask why I'm not looking at the camera, because I don't know that either. Top, Theory (similar from JC Penney). Heels, Zara (similar, on sale). As for the races, I won a couple of bucks and got to hang out with these lovely ladies, so the day was a success. The man at the drink counter kept calling me "The lady in the pretty skirt" every time I came to see him, which was pretty hilarious.